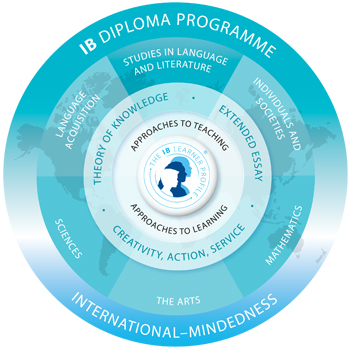 Following the Foundation Years, students enter the IB Diploma Program prepared and motivated after gaining experience with character-based projects and developing their critical thinking skills in a supportive learning environment. In preparing students for university entrance, the IBDP not only encourages a high-level of academic discipline through rigorous academics, but also to ask challenging questions, to develop a strong sense of their own identity and to have international communication skills and cultural awareness. research, writing and project management skills will be exceptional. The balance between academic work and co-curricular activities allows students to tailor the program according to their interests and develop an impressive university profile in the process. A round-table format enables students to engage in their lessons alongside their teacher and peers. This interactive classroom facilitates discussion and enables teachers to follow the progress of each individual student. Coaches at each class level ensure that every student is continuously challenged or receives any support they may need. This personalized attention allows for a deeper connection between the student and the learning environment. An Extended Essay Supervisor is assigned to each student based on their chosen EE subject during IB1. This supervisor collaborates with the student through the entirety of this research project for guidance and revision - from conception to submission to the IBO. A University Advisor begins the conversation in IB1 to help identify academic pursuits, aspirations and characteristics that the student would like to consider for their next steps. IB students continue their journey towards university with one-on-one support in preparing applications through to selecting their university offers from around the world. The mission statement of the IB Organization is known as the "Learner Profile." The characteristics of an IB Learner are represented in this inlaid video prepared by the IBO. Please feel free to visit the IBO Website for further information regarding the world-wide curriculum. International Baccalaureate Learner Profile from International Baccalaureate on Vimeo. IB schedules are personalized to meet the students' interests and strengths, where they choose 3 subjects at a higher (HL) level and 3 subjects at a standard level (SL). This enables each student to have a schedule that is tailored specifically to them and, based on their course selection, creates an average of 8-14 students per subject. A student is eligible for a bilingual IB Diploma if they select 2 languages from Group 1. The Arts are elective, allowing students to choose another subject from Groups 1-4 in lieu of Group 6 options. At the Core of the program lies the Theory of Knowledge, Extended Essay and Creativity, Action and Service courses. Environmental Systems is offered as a SL Transdisciplinary Subject, counting for either Group 3 or 4. Courses are organized in blocks and are subject to timetable availability. 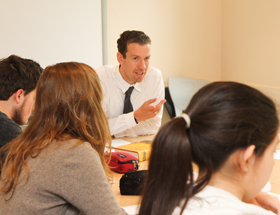 A minimum of 5 students is required for Ermitage to be able to offer a particular course. Certain courses may be organized as an online option. is a 4,000-word essay prepared during the IB years, with the support of our Research Librarian and an EE Supervisor. The emphasis is on original research, careful analysis, and academic rigor. TOK: TOK is a challenging course encouraging students to become critical thinkers and ask, “How do we know what we know?” Students are introduced to the concept of thinking outside the box in the Foundation Years, allowing them to explore their intellectual boundaries, challenge the sources of their knowledge, set individual goals and learn to work effectively in teams. The introductory courses, Incubator and TILT, prepare students for the IB level of TOK. CAS: enables students to maintain a balance between their demanding academic curriculum and developing their character as an individual. Thinking globally and acting locally, students foster leadership and management skills, allowing them to take the initiative with their learning. Creativity activities range from French cuisine to art. Action activities range from basketball to yoga. Students can also travel the globe for humanitarian work. In 2010, the Telegraph published an article, "The International Baccalaureate versus A-levels: which one will help your child shine?" offering perspective on the comparison between the two programs from the point of view of university admissions.